JERUSALEM—He’s been Israel’s prime minister, military chief, the country’s most decorated soldier and, for the past five years, its defense minister and moderate face to the West. Now Ehud Barak’s long and distinguished career might be coming to an end. He is unpopular with the public, and polls predict his Independence Party will barely make it into parliament in the Jan. 22 election, if at all. Most commentators predict his days in politics are numbered, but others say it may be too early to count the wily general out. The 70-year-old Barak earned his reputation as a warrior through a military career that included commanding some of Israel’s most daring hostage release operations and raids. In 1999, just four years after retiring from the military, Barak became prime minister. Political allies and foes alike considered him aloof and imperious, resenting the go-it-alone style that served him in the military. His term lasted less than two years—the shortest ever for an elected Israeli premier—his government crumbling with the outbreak of a Palestinian uprising that followed an unsuccessful summit with the Palestinian leader and U.S. president. He was crushed by hard-liner Ariel Sharon in a 2001 election, leaving behind a legacy of failed peacemaking with the Palestinians and Syria, despite unprecedented offers of sweeping territorial concessions, and a contentious decision to abruptly end Israel’s 18-year military occupation of south Lebanon. The overnight unilateral withdrawal from southern Lebanon created a vacuum that was quickly filled by the anti-Israel Hezbollah guerrilla group. Despite the dramatic collapse, Barak credited his wide-reaching offer to withdraw from nearly all of the West Bank and Gaza with exposing Palestinian leader Yasser Arafat’s essential rejection of the peace offer—a view endorsed by President Bill Clinton. Israeli hard-liners didn’t like him any better, accusing him of undercutting the West Bank settlement movement by withholding construction approvals, clearing squatters from West Bank homes and encouraging Netanyahu to support a now-expired, U.S.-initiated slowdown in settlement construction. Barak eventually broke away from Labor to form his new party, Independence, with a few junior allies. The party never resonated with the public, but Barak himself retained his clout in the Netanyahu government, acting as the prime minister’s point man to the United States. There, he was welcomed as a moderating influence on Netanyahu’s hard line toward the Arab world and Iran’s nuclear program. Yet even that alliance—dating back to the 1970s, when Barak was Netanyahu’s commander in the commando unit—seems to have suffered with reports that the two are at odds over whether to defer to the U.S. on any attack against Iranian nuclear facilities. 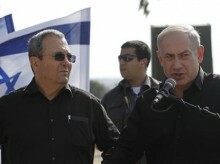 Barak’s detractors in Netanyahu’s Likud Party want him replaced and have begun criticizing him openly. This strategy does not seem to be working. A new poll published Monday in the Maariv daily predicted Barak’s Independence Party would not receive enough votes to win even a single seat in parliament. The survey, conducted by the TNS/Teleseker agency, questioned 500 people and had a margin of error of 4.5 percentage points. Similar polls in recent days had forecast Barak would win a maximum of three seats. Under Israel’s system of proportional representation, the number of votes a party receives determines how many seats it controls in parliament. If he doesn’t make it into parliament, he could still hang on to his job. Under Israeli law, Cabinet ministers besides the premier do not have to be elected lawmakers, and such appointments have been made in the past.